One of the core things that is desirable in any modern website is user interaction. So far we’ve implemented a contact form to allow our visitors to contact us, but in this post we’re going to go a step further and create a way for users to comment on our library selections and share their thoughts about the books we’re recommending. You can use this to add comments to a blog, or any other content type that you desire. What we want is to have a comment form and comments appear below each entry so that visitors can leave a comment and read the comments left by others. The first thing of course, is to go into your Resources area, under Snippets, and check to see if you have Jot installed and make sure you have the latest version. As of this writing, the latest version for Evolution is 1.1.4. 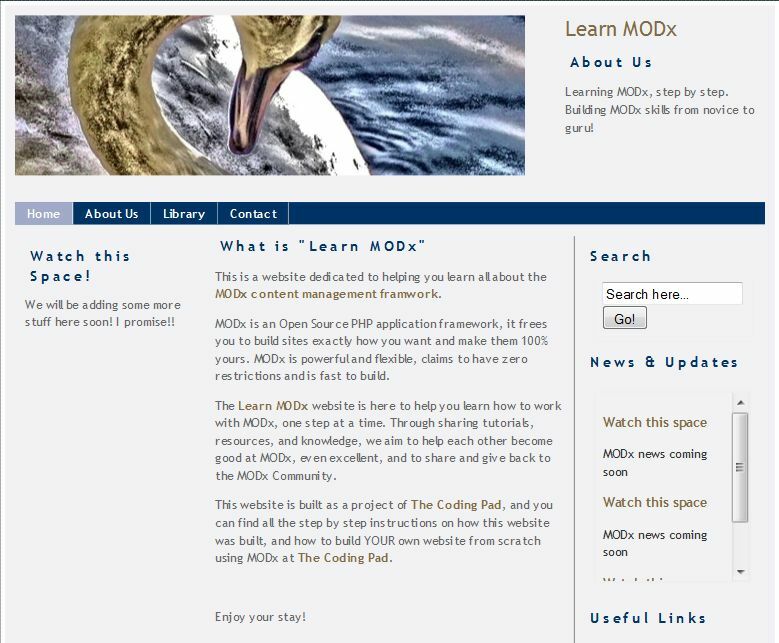 If you don’t have it installed, you can download it from http://modxcms.com/extras/package/216 and follow the install instructions. Ofcourse we will add more parameters to further customize our call but for now let’s see what this does. You can add this call directly to the Library container page like we did with the Ditto call, or we can use a Chunk and then throw that into the library template. If you read the Wiki you will see that it is recommended that you place your call in a chunk. I also find it neater and easier to manage. Create a new chunk and call it Library_Comments. Then type the basic Jot call above into the chunk and save it. Now we need to see what other parameters we can add to our Jot call to further configure our comment form functionality. If you look at the MODx wiki linked to below, you’ll see the long list of parameters, their default values, and what they do. I won’t go through all of them as that would be redundant. The first and most obvious thing you worry about with comment forms is the possibility of abuse and spam. Two ways to tackle this is to moderate all comments (except maybe for certain individuals), or to use a Captcha to discourage bots. Many times you will use both options. First I am going to set the captcha on for everyone except registerd users who are signed in, even though I haven’t created the possibility for my site to have registered users besides myself. Next, I am going to set moderation on. I would like my visitors to leave their name and email address on the comment form, which is common practice. We do this by adding the &customfields parameter. Once you add this to your snippet, it defaults to adding a name and email field, but you can add other fields such as url, etc. Be careful with the &customfields parameter because you should not have any spaces in the comma separated list of fields. Again, make sure that there’s no spacing between the comma separated values of the &validate parameter. You can read up on the syntax of these arguments on the Wiki page linked to at the end of this post. OK, let’s take a look at our page. To clearly appreciate the changes, make sure that you’re logged out of the admin area so that you can see all the fields as well as the CAPTCHA. For now though we’ll leave it at this and then revisit it once we’ve added usergroups and allowed membership on our MODx site. Go ahead and test your comment form and make sure it works like you want it to. To see the comments that have been posted, log back into your site as admin and open the entries from the front end. 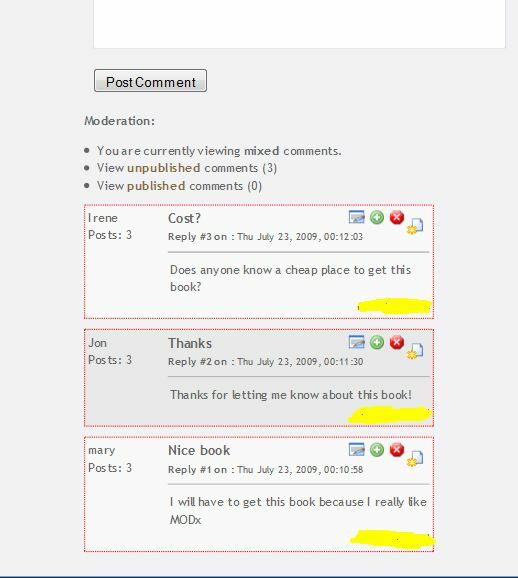 You will then see the unpublished comments at the bottom so that you can moderate them. When you’re logged in as admin, you can also see the IP addresses of all the commenters, which I have yellowed out in the screenshots. However, once logged out the IP addresses are no longer visible. One thing that still has me baffled is how to moderate comments on the backend of your MODx site. As far as I can see, you can only moderate comments from the front end. If anyone knows different, please let me know! You will notice that by default, Jot displays the comment form before the comments. I prefer to have the comment form after the comments in my websites. We can change this easily using the &output and &placeholder parameters. We first set &output to zero to hide the output, and then specify that we want to use placeholders. Then below the Jot call, add the placeholders in the order in which you want them. So this will place the comments first, then paging, then the moderation options, and finally the form. You can see now that everything is appearing in the order I specified, with comments first and form last. You can also see that I have paging of comments with five comments per page. By now you should be familiar enough with the MODx syntax to know that this will add a hyperlinked entry with the word Comments, and we’ve added the Jot call in parenthesis with only one argument – &action. The role of &action is to determine what will be displayed when you call Jot. By default, it displays the form and the comments, and so we don’t need to state it explicitly if that’s all we want to display. This is why we didn’t add it to our initial call. But in this case we want to display the number of comments, so we set it to count-comments. One last little touch I’ve added is to place the div name of the Library_Comments chunk as an anchor tag to the link so that a visitor can click on it and go straight to the comments. That is why I put the call in a div! 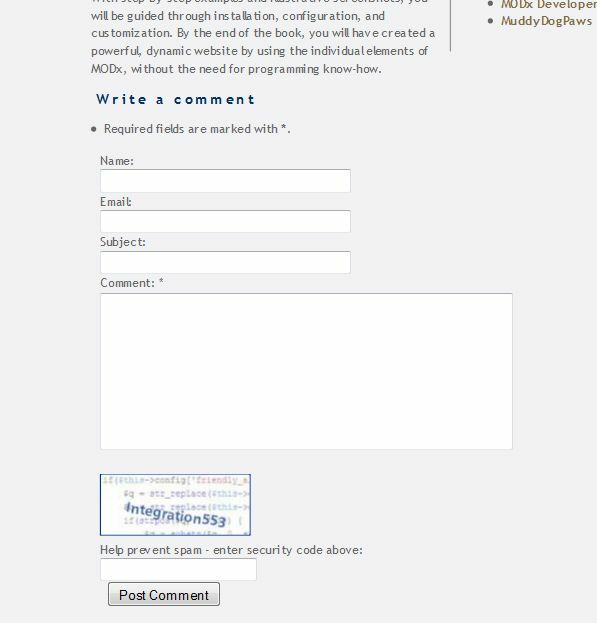 🙂 If we now take a look at our Library page, you will see that each entry title states how many comments the entry has. And there we go! We’ve covered quite a bit today, and hopefully you can see how Jot can be applied in different scenarios, for example in creating a blog or any other content type with comments in it. There’s a lot more to explore in the documentation linked to below, and I encourage you to spend time in the forums and see how people are using and customizing Jot on their websites. 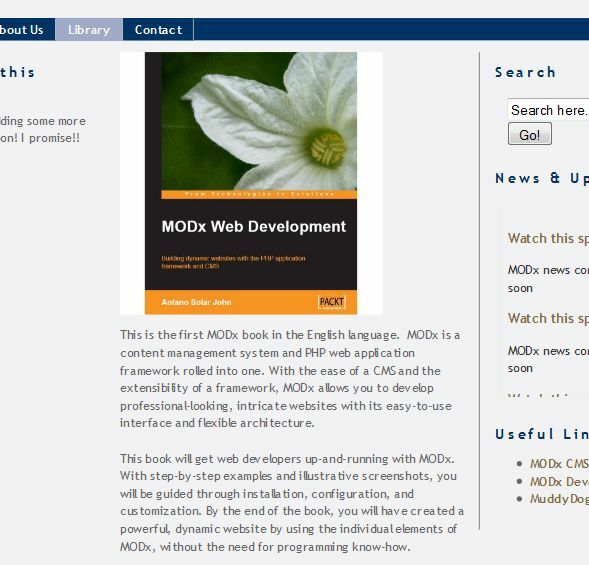 And don’t forget to grab your copy of the MODx Web Development book! Thanks for the feedback 🙂 Glad you’re finding the tutorials helpful and understandable! Thanks Ian, will do my best!! Awesome tutorials!! Would you be able to add the WebLogIn and Webregister snippets?? I would greatly appreciate it! Thanks! Have those two in my queue of tutorials to write. Keep tuned, subscribe, and check back in. I bombed through your tutorials in the last day, and found them extraordinarily helpful. Much thanks! As you hinted, registered users is something still to cover. My current needs don’t fall there, but I would be interested in more information about other administrative users – maintaining control over the site, but allowing others to change certain chunks, etc. Looking forward to hearing more! thanks for your feedback. Will do my best to cover this too. Another brilliant tut; good job! Thanks a lot mate for a perfect tutorial. I would never manage to do it without your help. Hi, I’ve been following along with your tutorial series and they have been very helpful – thank you. Hmm, I would have to give that a try. I haven’t used the PHx plugin at all to this point in my MODx work so I don’t have an answer for you. It might help to ask on the MODx forums also. What are you using the PHx plugin for? The default caching status for documents on the website is “cacheable.” So the “Library” document had a non-cacheable call to Ditto (i.e. used “[!”) and a non-cacheable call to Jot in the “Library_Comments” chunk. I also seemed to need to make a *cached* call to Jot in the template being used by the Ditto call to show the number of comments an item had received. My remaining issue is an inability to tab between the fields in the “write a comment” section that Jot provides. Any thoughts on that or is it likely something specific to my setup? Just wanted to thank you for a series of very helpful tuts. 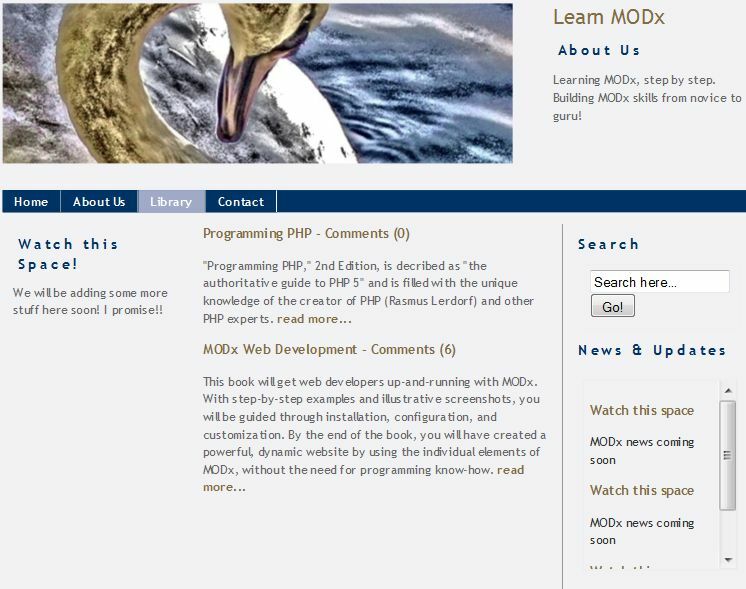 Your blog are the next best modX help (right after the official site). I am experiencing some trouble with your chunk though. Don’t know if it has anything to do with phx. Everything works like a charm until I add the part with the placeholders. I am using your exact code. Do you have a quick by hand solution for this? Thanks again for the helpful blog. I went through all of your tutorials today – I have a basic knowledge in MODx and your tuorials helped me a lot, very well written and easy to understand! Just thought I’d say thanks! It seems that when I call Jot in my library template chunk it doesn’t execute properly. Can you paste the full code of your library template chunk? I think this may be the first time i’ve used the xmp tag. And what this does is output the code on the page instead of the number of comments? where “Successful Small-Scale Farming” is the title of the book. i’m developing locally and looking into configuring MAMP so that you can view my environment. Are your comments showing up okay? Are you sure you have the Jot snippet installed? The page is obviously able to parse the page id but not the Jot call. Check under Resources->Manage Resources->Snippets, and make sure Jot is actually listed there. Also tell me what version of MODx and of Jot you’re using. And since you’re following these tutorials it’s safe to assume you’re using either MODx 0.9.6.3 or 1.0, so the call should work. Hmmm, not sure what could be wrong 🙁 . It’s probably something really simple but I’m not seeing it. Let me know if you can get me into your MAMP setup. Not sure how that works. I’ll also think on it some more and see if I can come up with a reason why it’s not working. Two more things I’m going to suggest: make sure your opening and closing quote marks (“)look okay, in other words, type them in yourself, don’t copy/paste from the tutorial. Sometimes WP formatting screws that up. Second thing, make sure you have the Editor to use turned to None when editing your chunk so it doesn’t add any strange formatting to your code. Finally, clear your site cache and try again. i just setup access to my local environment. i sent login credentials over via your guestbook. Can’t access that email address from my current location until later this evening. Can you send them to einsteinsboi at gmail dot com? I’m getting the exact same error with my site. If you go to http://www.spotifyspot.com and then the playlists page, you will see. that’s interesting, it works for me uncached. What if you cache it? Seemed to work for Nick like that. But it works for me uncached. Is your page cached or uncached? If you have rich text editor on when entering the snippet call make sure you turn that off, clear your site cache from the manager and then try again. Hi mary, first of all sorry for postint so much in such a short timespan. Sorry for the messy post, trying to give all info that might be necessary. I haven’t used 1.0.1 yet. One good practice is to always check the MODx forums to see if anyone else has had a similar issue. When I get the chance I will take a look at it too. If you do find a solution before I do please come back and post it here so others can benefit. Thank you so much for your tutorials. I’ve learned so much, they’ve made my work a lot easier. One question: How do I edit jot’s css? Ok 2 questions. Like you I would like to use leave a comment instead of write a comment. How do I change the text? You can create your own css files to style Jot. This is better than modifying the default jot.css file that is included. Then you call your custom css file using the &cssFile parameter. You can find the details on this parameter on the Jot wiki page linked to at the end of the post. How would I add the jot form to a separate page? I haven’t had a chance to try this out but it should work. Create a new page and then add the jot call to that page. In your Jot call, use the &docid parameter to link back to your original page. Great Tut! I hope there are more! Is this the end? You have done a great job. Very easy to understand and follow along. You are an asset to the MODx community! I currently have a site built with Joomla, that I did before learning about MODx. Everyone said, “Just use Joomla, everyone is using it!”. Drat! Looks to me like MODx has a lot more flexibility and is a lot easier to control. Is there an easy way to move a Joomla site to a MODx site? The site that I currently have, has “registered” users, so I have all of that information to “bring” over. I still have to learn about the “users” in MODx, but from what I can see, I will have a lot more control. The current Joomla site is: http://www.uipuniversity.org This is the one that I’d like to redo in MODx, but I’m not sure on the user information. Thanks for the very insightful tutorials on MODx and I’ll be checking for more! thanks for your feedback. Yes, there will be more tutorials. 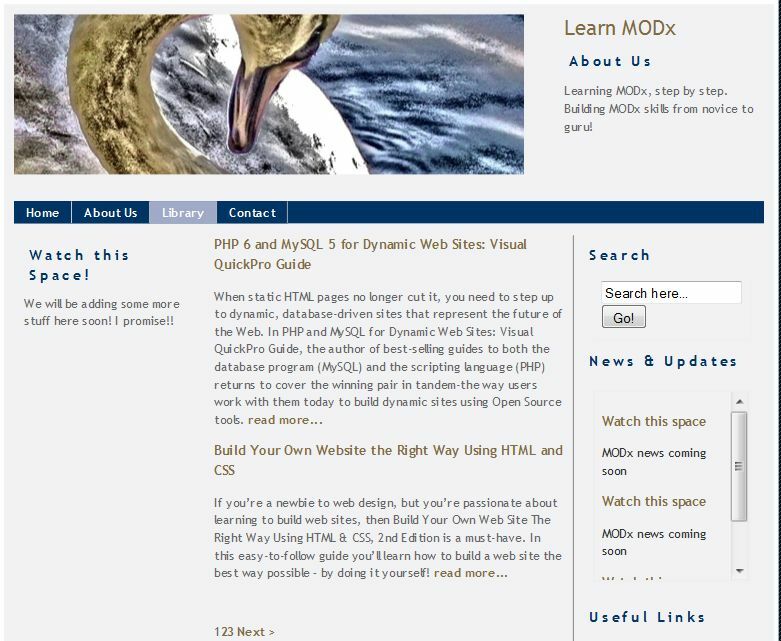 I’m sure it’s possible to move your site from Joomla to MODx. I don’t know if there’s an “easy way” per se, because I haven’t really done any site portings yet, and I generally don’t use Joomla. But I definitely think it’s doable. Have a look around the MODx forums and ask to see if anyone has any ideas on the best approach to take to transferring your site. It’s a good looking site and looks like it would definitely not be hard to do in MODx. Many thanks for the great tuts – a real lifesaver! 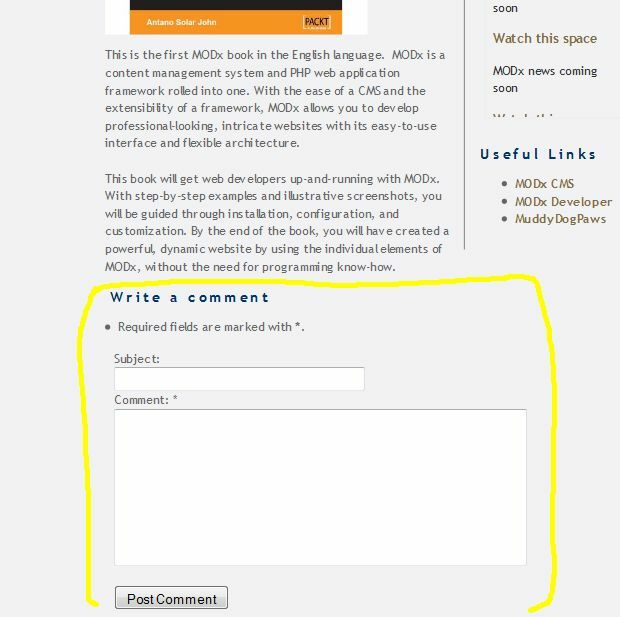 One question, when the user adds a comment and their email address, where is the address saved and how do you access this data in modx? This information would be stored in your database in the (prefix)_jot_fields table. I added the prefix there for whatever your table prefix is. The only way I can think of at the moment to access this information from MODx besides actually going into your database is to open the commend for editing and then retrieve the email address that way. If I think of another way I’ll let you know. You may also want to ask on the MODx forums. I am currently stuck on allowing only registered users to add comments. I have been using this code. placing this into a chunk and calling that chunk on the pages I need to allow registered users to post..
Not sure I understand what you’re saying here. Do you only want registered users to post or do you want anyone to post and then you moderate the comments? Which of the two calls are you using and what errors do you get? [!Jot? &canpost=`Registered Users`!] I have created a chunk and added this jot call to it, then I am calling the chunk on the pages I want the comment to go on (not all of the pages). When I do this web users can log in but cannot make comment(they can see the comment tho). So I have been trying to add your code so that when a web user logs in they can make comment. But all other visitors to the site can still see the comments web users have made. I know this would be a really good function to have I just cannot get it working. If you send us your email I will send you a link to the web site if you would like? Do you have a web group Registered Users? Yes I have created a web group for registered Users, I have one web users in it at the mo. Hmm, I have to admit I’m not too sure how user permissions would work with regards to Jot. I would imagine that once the users are members of the Registered Users web group they should be able to post comments as specified by your Jot call. I might have to play with this when I have time to see if I can reproduce the problem. You should also post on the MODx forums and might get a faster answer there from someone who’s faced this situation before. If you find a solution before I get a chance to test this I would be grateful if you would come back and post it here for the benefit of others who may run into the same situation. I read this article to see if you had found a way to manage jot comments from admin. The post above by Kongondo mentioned a new module, Joco, – and it’s brilliant! Thanks for reporting back Peter. I haven’t had a chance to try Joco yet, got caught up with other projects, but I will definitely play with it. Does jot/modX allow for the “Reply” feature and the “Notify me of followup comments via e-mail” like your website does? You can also explore using a service like Disqus for commenting, I think it offers those features. Long time old friend!! Thanks for the compliment!! Glad you’ve found the tuts useful. How’s Chicago? Thanks for this fab tutorial. It’s so easy to follow. I’m having a problem getting jot to display the &customfields `name,email`. All I get displayed are the subject, Comment and captcha fields. any idea why that might happen? You don’t need to add name and email as custom fields, Jot defaults to those two anyway even if you don’t add that parameter. Mary, thanks for that. I noticed the typo just after I’d posted it. 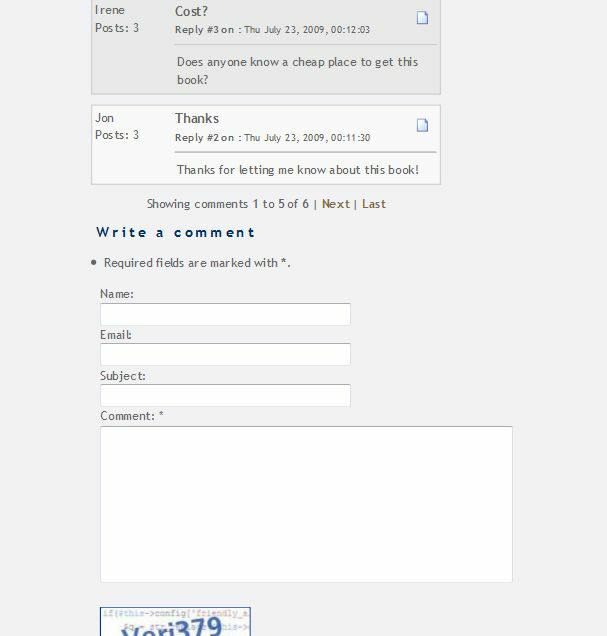 Yet, the name and e-mail fields are not showing up as part of the comment form. There are only three form fields: subject and comments and captcha. Any idea why? Perhaps, because I’m logged in as admin? Thanks for your help with this. Just finished completing the tutorials a few hours ago. I really enjoyed doing so and it surprised how much you can do with such a basic template. Thumbs up for Mary and modx. Many thanks, Mary. That was really helpful. Thanks for this – really good – had a few problems with typos and had similar issues with the caching/uncaching re comments in ditto – but all sorted now – working on a blog site for when we go away http://www.anotherharddayattheoffice.co.uk/monday-thursday.html this is the comments & ditto just on one page. Not sure what you mean by “show directly”. You’ll need to elaborate on that. i think you need to call the snippet uncached. Thank you Mary for the perfect tutorials (I did all the beginner’s). Very well explained and good quality. WOW, guys I think my search is over! MODx is incredible and it has so many add-ons. I looking at it and the wrapping of you design with MODx is very easy. Yoohoo, thank you so very much! 🙂 Glad you’e enjoying it! MODx rocks! I was wondering if you could help me to Enable Google Transliteration in comment box so that web user can submit comment on different language if they want to. I have never used Google transliteration so I would need to do a little bit of research on this. Send me an email so that I remember to look into it. I would also suggest asking around the forums, especially the international section, you may find someone who has tackled this before. I want to set up an website with database integrated in it. But I do not have any idea how to do this using MODX. To that end Could i please request you to give me some idea for which will pay and how could i arrange such type of meeting. please help. Do you know where you changed this text from white to black? Not quite sure I understand your question. Can you explain what you mean? Still the best tutorial out there, needed a refresher on Jot and this fitted the bill. I have finally got around to making this work on my website, I know this sounds like a silly question but how do you publish the comments so they are visible on the site with out logging in? By default the comments should be viewable to everyone who visits your website unless you restrict the viewers by using the &canview parameter. Did you follow all the steps for setting up the comments area? Thanks for your reply I removed &canview and the comments became visible, which is great thanks. And change the background colour of the comment box. Have you changed this CSS, if so do you know the path? I have not explained myself to well again sorry.. I know you can use &cssFile parameter to create your own CSS file but if I could find where this code is located I would not need to do that..
Do you know where it is located Mary? and so on. If some of them aren’t taking you could use !important. This way you don’t have to use the parameter. If a class or ID is present you just create a custom css. All Jot stuff is in assets/snippets/jot/. Sometimes the code have assign ID and classes but you can’t see the because no css have been created but since ID and classes already exist you can create a new css style for them. Also, you can do a ‘Search and Replace’ with Dreamweaver, etc. and look for something, i don’t know, #000, font-size, etc. This post was long time ago but it can help some one else. Hi Michael! Also, you can create a custom .css (my-style.css) and put in it class name you want to change. Then, link it after your last and it’ll take presedence overwriting the class, this way you don’t have to go crazy looking for it. Often I look to find a solution to a problem the most difficult way possible, not realiseing the answer right there infront of me lol. HI Alex thanks for your advice, but i want to combine my external css file into one and not create another one, i think thats bad for page speed. I cannot say much tho I have four external css files on my site ..
but it doesn’t show the name of the person that submits a message… it says Admin when i (the admin) post something.. In you example is see the name :irene etc… how dit you do that?